What does it mean to be a champion? Is it defined by the number of races won, the medals earned, the times left in the record books? Or is it something else entirely? Carl Lewis is a 10-time Olympic medalist, eight-time World Champion, and one of the best to ever compete. But he’s also more than that. 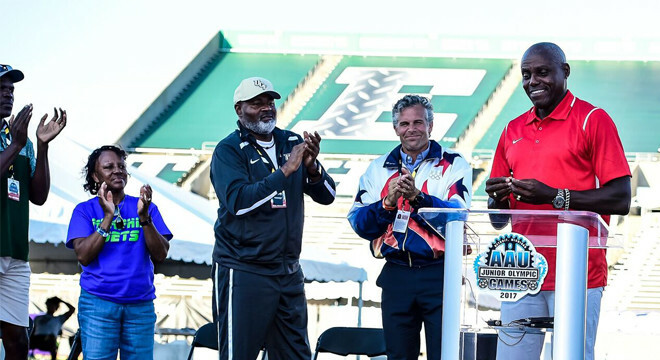 He’s an icon who professionalized track & field and a mentor who works tirelessly with the next generation of athletes to ensure the sport’s advancement. His extraordinary impact on track & field is the true mark of a champion. 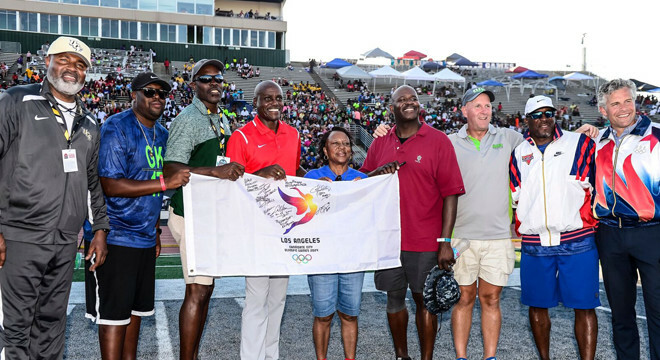 For Carl Lewis, the future is his legacy. Lewis began competing in track through AAU during the late 1960s, and his family played a major role. With many relatives who were Olympic and collegiate-level athletes, his parents became his first coaches and older siblings became his role models. Lewis took full advantage of that opportunity. For him, track was more than a hobby. It was his passion. His life. His dream. And as his jumps got longer and his race times grew faster, the world started to take notice. "I realized the magnitude of everything I was doing, and it was pretty amazing." It’s difficult for Lewis to pick a favorite moment on the track. He’s torn between 1984 in L.A. and 1996 in Atlanta, the two Olympic Games that stand as bookends to his competitive career. One overwhelming, and one a little bittersweet. But on one point, he is 100% clear. 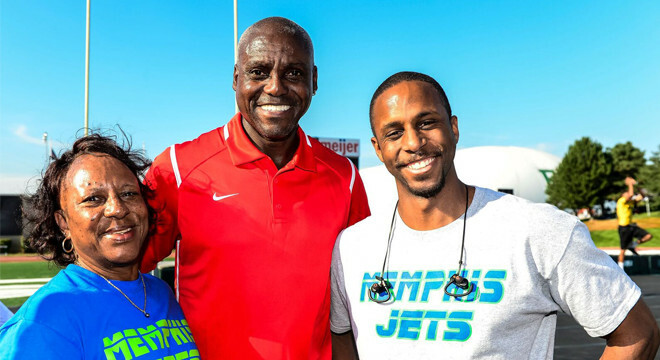 All of life’s most compelling stories come full circle, and Carl Lewis is no exception. Today, he applies this fearless attitude to coaching at his alma mater, the University of Houston. His biggest advantage as a coach is a deep understanding of what his athletes are going through. And, as Lewis knows all too well, most of the time there’s A LOT going through an athlete’s mind. “That’s one of the biggest problems athletes have,” Lewis said. “They try to be too emotional instead of simple and focused. It’s really about simplicity — slowing everything down and focusing on what you’re doing, trying to work on what you can control. "You improve during the week and you show it in the meet. Spend the week building the confidence to perform on Saturday." To keep his athletes motivated through the weekly grind of training, Lewis creates simple ways for sprinters to measure their own success. But helping college athletes isn’t enough for Lewis. He wants to start sooner. Through his partnership with AAU Track & Field, Lewis hopes to grow the sport for years to come, helping athletes make strides early on in their careers, so that when they reach higher levels of competition, they’re ready to chase down success. That’s why he’s created The Perfect Method, a training program designed to help mentor runners looking to improve at all levels. The Perfect Method isn’t a one-size-fits-all training method. Instead, it’s a personal program tailored to help each athlete reach their personal goals by focusing on three areas. “It’s the mechanics, it’s the psychological readiness, it’s diet and nutrition,” Lewis explained. “It’s everything. The reason I call it The Perfect Method is because I want everyone to want to be perfect. To be the perfect you. Being your good is not enough. Being your best is what we’re trying to do. "As a coach, my goal is for every single runner on earth to know exactly how to run their best — every single 5K runner and every single casual runner. And AAU gives me the direct opportunity to reach young people in a way that I never could have otherwise. Members of AAU Track & Field can benefit from The Perfect Method immediately, with a trial of the online coaching portal at theperfectmethod.net.